I have become so in love with Annie dollys lately. I went through my black doll phase rather quickly, I'm sad to say, but Annie dollys have taken over my world and I can't seem to stop making them. 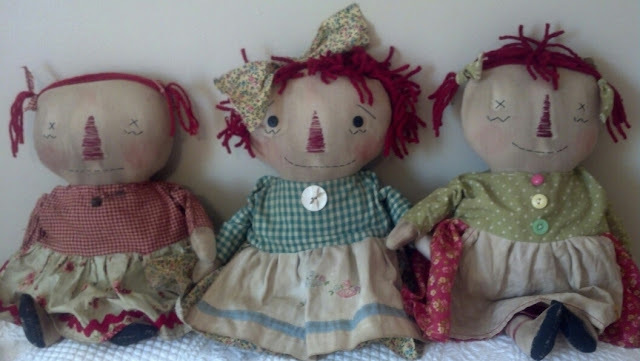 Below are 5 Annie dollys I have made for my booth here in Martinsburg, WV. Although I have not tucked them in the booth yet. I still need to paint it and get it ready for my girls! I used vintage hankys for their aprons, with some vintage buttons too! I bought an Annie dolly from a friend of mine in PA and she looks alot like the dollys on the left and right of the Annie with button eyes, just above. 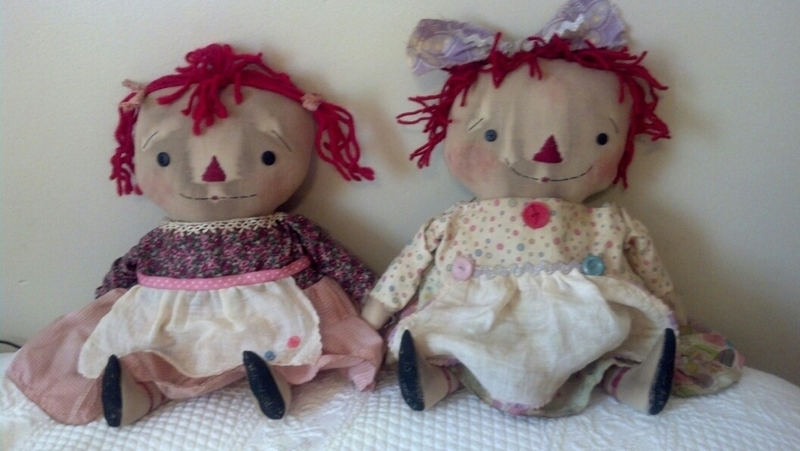 I fell in love with that doll and realized I had the pattern so off to the craft room to make one, well maybe 2, ok 3, awww heck how about 5 Annie dollys. You know their like potatoe chips you can't just make one! So now I have 5 Annie dollys and 2 are more child like looking than the other 3, but that is just fine for me. They are my favorites. Okay, so are the other 3 Annie's, awwww heck all of them are my favorites. LOL! I love when a Annie dolly comes together and they turn out the way you want em too! I think I am in love with Annies for keeps. Sounds like a great name for my booth. "Keepsake Annies". Hum...I will think on that one.